How do I redirect my readers, to my new URL? And this is a need that will likely go unfulfilled. Blogger wants to keep the Blogger infrastructure as free from spam, as possible. Changing the URL is simple enough. 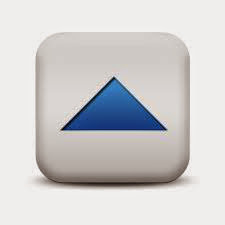 Just use the Publishing wizard, in the Settings - Basic page, and Edit the "Blog Address". 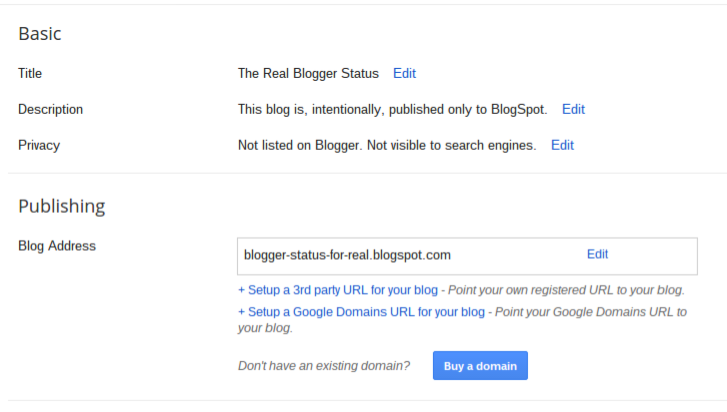 Subject to availability, your blog will have a new URL - as you watch. The change is not difficult. Just Edit "Blog Address". But with a new URL, unplanned, you'll lose traffic. 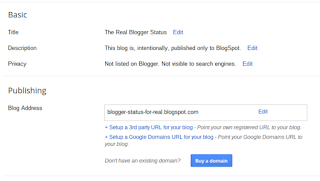 Blogger does not support automated blog to blog redirection. You can use passive redirection, though - and give your readers the choice, to read the blog using the new URL. Setup a stub blog, at the old URL. Publish a blog at the old URL - and pair the old and new blogs, actively. There are a number of possible techniques to use, to combine two blogs as equals. You will need informative, interesting, and unique content, for both blogs, to get the most from this approach. Publish a blog at the old URL - and add a single post, advising your readers about the change - with a link, taking them to the new blog. You can use a custom 404 display, to collect all existing links to posts in the blog, which will take your readers to the single post. A Featured Post is perfect, as the single post in the stub blog. You can redirect the blog posts feed, even though you can't redirect the posts themselves. Just redirect the old blog feed, to the new blog posts feed URL. Combine the two approaches, if you like. There's no need to consider the two approaches as mutually exclusive. You can use techniques from each, if you like. Simply pick an approach that suits your readers. Just don't look for automated redirection. That's not likely to happen. Some #Blogger blog owners decide to change the URL of their blog - then ask how to setup automated redirection, from the old URL to the new. That is, however not likely to be an option provided, or even allowed, by Blogger.